There are many milestones on the road through grade school math, but one in particular marks an especially significant destination. It’s the motherlode of arithmetic, a recipe with so many of the previous numerical ingredients from so many previous grades, a mountain of math skill awaiting its ascent, a task requiring the flexing of a mixed metaphor of mental muscles like no other. And also, the one thing that strikes terror into a math-phobic 4th grader’s heart like the threat of a missed recess. But does long division really need this huge build up? Is it really that much more difficult than, say, multiple-digit multiplication? Yes and no. Long division is certainly a test of many different skills, but they are all ones that should be largely rote by the time long division is introduced. I believe the main issue that brings tears and seizures when long division pops up is essentially a lack of confidence in basic math facts. Learning the long division algorithm is a little daunting, but it’s a small step if the prerequisites are truly mastered. And so, let me just say it again… Drill, baby, drill. That said, why is long division such an important rite of passage? The four basic steps in long division (partial division, multiplying, subtracting, bringing down) all incorporate concepts ranging from basic operations and place value to simple numerical algorithms. These skills mimic a lot of what later, more abstract, math looks like. I’m staring at you algebra, hiding there around the corner. Long division is the arithmetic skill that most closely resembles the mechanics of tasks in algebra, trigonometry, calculus and more. It requires doing several basic operations in a particular sequence, thinking about their results, trying intermediate solutions (especially with multiple digit divisors), backtracking and hopefully making sense of the process along the way. This makes long division not just another skill to learn on the journey… It’s the first step down a completely different road. Of course I wouldn’t be a good dad if I didn’t offer directions! I’ve had a collection long division worksheets with detailed answer keys on the site for quite some time, and they’re actually some of the top ranked math worksheets on the web. I’ve also just created a long division calculator, and it’s one of the best teacher resources I’ve built on the site in a long time. Enter a divisor and a dividend, and it will work the problem in front of you, with remainders, in real time, and it provides guides that show where all the numbers come from. Trying to get across where that intermediate product comes from in that jumble below the problem? Watch the calculator run its course, then put your mouse over the digit in the quotient to highlight it and the product. It really is useful and it was a lot of fun to build…. I hope you’ll give it a try yourself and share it with anyone you know that’s learning or teaching long division… It’ll go a long way towards paving that road towards future success in math. Posted by Dad on February 13th, 2017 in Roman Numerals, Worksheets Add Your Thoughts! Roman Numerals are one of those skills that seem unimportant until you realize you how often they show up all around you. You’ll see Roman numerals on everyday objects like clocks or buildings, but students progress into the science or law related subjects, you’ll start seeing Roman numerals showing up all over the place. Because of this, learning to read Roman numerals is a skill every student should be exposed to in the primary grades. I’ve added a bunch of great Roman numeral resources to the site, including this Roman numeral converter and these Roman numeral charts. 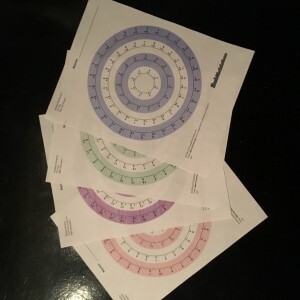 The Roman numeral charts are a great reference tool and include the rules for Roman numerals, so they could make the basis for a Roman numeral unit in the classroom. But of course, you’ll need some worksheets for practice and assessment! With that in mind, here’s a collection perfect for your little Centurions to work on! Something New for Your Multiplication Tool Box! 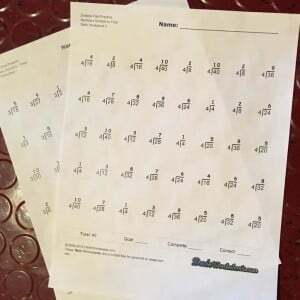 My collection of multiplication charts has become one of the most popular collection of multiplication printables on the Internet, but several of you have said, “Hey Dad, where are the multiplication tables? And I haven’t had a good answer. Multiplication tables focus on a single set of facts, for example the times 12 multiplication table lists all of the individual facts that include 12 as one of the multiplicands. Because the facts are presented in order, they make a nice bridge between skip counting and memorization. The multiplication table pages at the link above include versions that are suitable for reference sheets (with all of the facts solved), but there are also versions that don’t have answers (multiplication table worksheets essentially). 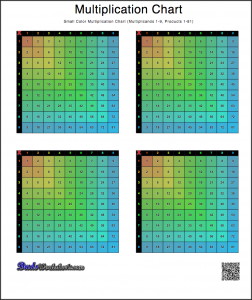 These multiplication tables print beautifully, and there are versions in color and B&W for each printable. You’ll find multiplication tables that have multiple fact families on them (like the multiplication table shown above), or “singles” that have exactly one multiplication table per page for a specific set of facts. Those single table pages have interesting number facts on them, which can make them a nice overview page if you’re using a “number of the week” approach to introducing multiplication facts in the classroom. No matter how you’re tackling multiplication, I hope these help! If you like them, please consider sharing them with other teachers or parents you know via social media, or linking to the multiplication table page! Your help getting the word out there means a lot to me! Posted by Dad on February 23rd, 2016 in Worksheets Add Your Thoughts! Friends! In this era of polarized political punditry, care must indeed be taken to avoid tarnishing with undeserved negativity the very verbal tools we employ. Even supposing the differences found in our associates, our family members or our beloved (or, not so much) electoral candidates are themselves perhaps less important than they seem (or, perhaps, even more not so much), irrespective of nuance, the words we use may escalate these comparisons to Brobdingnagian proportion, and in doing so toss those loyal lexical minions into the political muck. I loathe to say that such a fate befalls our dear associate “division” and his close kin, which in political parlance has accumulated such a dreadfully undeserved connotation. Subtraction? So negative. But division, yes, division we need by our side in its purist form. This mighty mathematical sword brings so much to our struggle for the equitable partitioning of cakes and other deserts, the proportional reduction of recipes for the making of optimistically smaller quantities of these and other tasty treats, and, importantly, the required percentage calculation of caloric reduction to target weight loss after over indulgence in what may have ultimately been a non-equitable distribution of said dessert portions. Indeed, without division, we would all be, colloquially, fat cats. So, take cautious heed not to bandy about words such as division or divided or divisiveness with abandon lest you too sully the reputation of this fine arithmetical specimen. Instead, share with your friends these shiny new division facts worksheets that are designed to fill an otherwise unnoticed gap in the division content on the site. They will hone your skills with basic division facts grouped by distinct divisors. And, they’re vastly more fun than watching the primary debates. Put a Little Multiplication Chart in Your Pocket! Sometimes a letter size piece of paper is just too much, even for a 100 multiplication facts. Sometimes you just need something a little more discrete, something that you can slip into your pocket, something you can reach for on a moment’s notice without the social stigma that comes from unfurling a giant multiplication chart out of your backpack and announcing you can’t remember the product of 6×7 to the world. Again. Well, maybe not you, but maybe one of your budding math minions. Oh, and it’s 42 by the way. Put the chart away, seriously. It’s embarrassing. Hit the Math Facts Bullseye! Posted by Dad on December 15th, 2015 in Worksheets Add Your Thoughts! Are your students missing the target when it comes to learning math facts? These cool new bullseye worksheets can help! Students get bored easily with the same worksheets over and over again, but there’s no substitute for simply working the problems until the facts are mastered. These worksheets are another interesting approach that helps engage students in ways beyond just pushing the pencil down the line and filling in the answers. Try these and the spiral worksheets for a change of pace and see how much faster those math facts get memorized! Check Out These Addition, Subtraction and Division Spiral Worksheets! Posted by Dad on December 2nd, 2015 in Worksheets Add Your Thoughts! 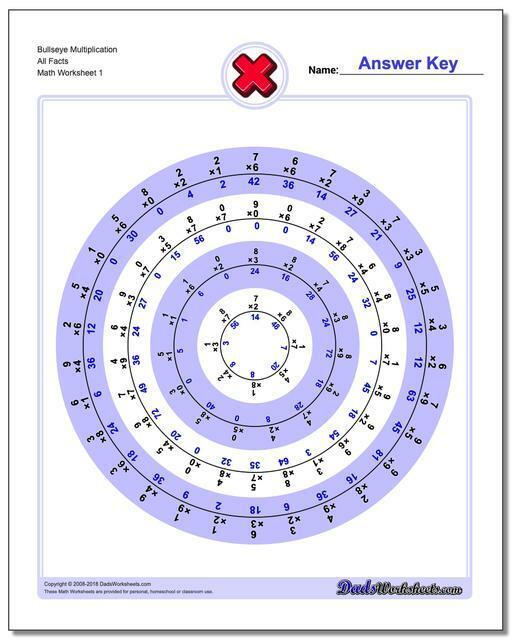 Were you waiting for more spiral worksheets for the other math facts? 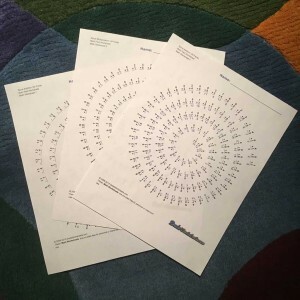 Spiral fact worksheets for addition, subtraction and division have joined the multiplication worksheets posted earlier, and you can find all of them at the links below!